The study found that shoppers usually end up buying a product in a physical store after researching it on mobile while in store, but it is often not the same physical store where the mobile research began. The next most likely scenario is to buy the product from another store’s website after leaving the store, using either a mobile phone or a personal computer. Almost 30% of customers want retailers to use location-based technologies such as iBeacons to give them a personalised customer experience. Research by Salesforce has revealed that customers want physical retail spaces to know who they are when they enter a building to feel more like they have a one-to-one relationship with the retailer. Shoppers are also willing to share their personal information with the retailer to improve the shopping experience, and 39% of consumers said they would be happy for a retailer to use their personal information to provide a better service. The Internet of Things (IoT) is poised to generate the next economic big bang. But the expected boom will go bust if people worry about losing their privacy in the IoT ecosystem. The time is right for the stakeholders who stand to gain billions from the IoT to rally behind a common privacy standard that earns user trust. Industry analysts agree on one thing: An explosion of Internet-enabled consumer products, connected cars, smart homes and wearables will generate a global economic boom over the next five years. One third of enterprise respondents to Computerworld’s Forecast Study 2015 last November said they were initiating IoT initiatives this year. Forbes reported in July that the pace had dramatically accelerated, with over three-quarters now jumping onto the IoT bandwagon. The result? Twenty-four billion Internet-connected devices — over three per person on the planet — before the decade is up, by some estimates. Whether this explosion amounts to the $1.7 trillion annual spend that IDC predicts depends on two factors: the value this IoT delivers to users and user trust in its privacy and security. Christmas is by far the biggest event in the retail calendar. So, with online sales exceeding £22bn over the holiday last year, it’s hardly a surprise that marketers have been planning since the end of last year’s festivities – if not since last Christmas. The holiday build-up, the Christmas Eve rush, the Boxing Day sales have long been key points in any retailer’s calendar with billions being spent year-on-year by brands. The arrival of new festive retail phenomena such as Black Friday and Cyber Monday are increasingly extending the traditional Christmas spending period. The Black Friday bonanza helped online retail sales surpass £1bn in one day for the first time last week, and now brands need to think carefully about other opportunities they can tap into across the Christmas customer journey. It isn’t just Black Friday and Cyber Monday when consumers are looking to buy gifts for Christmas. Figures now show that consumers are beginning searches for ‘Christmas’ as early in the year as September. Mobile sales and traffic began climbing mid-last week and stayed strong through Sunday. 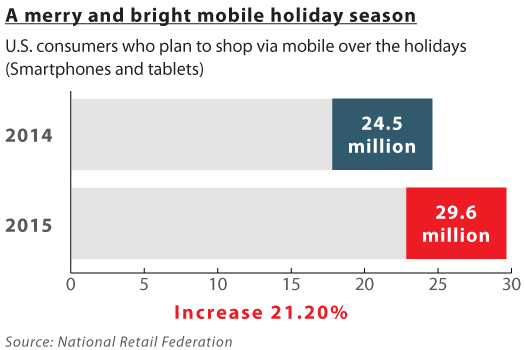 Mobile sales came as an early and strong holiday gift for many merchants this past week, according to online sales data as the holiday shopping moved into high gear. The big story over Thanksgiving weekend for online marketplace eBay was mobile with shoppers significantly increasing their mobile spending over 2014.